Helen Waddington for Ilkley Skyline. From Jo Foster... three Harriers did this 7 mile Fell Race from Mytholmroyd. We all had good runs, just missing out on the prizes. The race was won by Tom McGuinness of East Cheshire in 45.33, very close to the record. A great route with fantastic views. From Steve Turland ... Stood on the start line with 62 miles and 11,000ft of climb ahead was a little bit daunting, and after 20m I sat down at Dent feeling very tired, wishing I'd chosen the 3 Peaks instead. Only 42 miles to go! Crammed as much food down as I could, and after 20 minutes of feeling sick, started to feel good again. Each checkpoint gradually passed, until the wheels started falling off again around the 50m mark. Last stretch seemed to go on forever and finally arrived back at Grassington in the early hours having got round in 16 hours. Managed to find a new level of pain and suffering on the day, but loved every minute of it. Great event, great camaraderie and weather was very kind to us too. From Alison Weston ... Mary Gibbons and Alison Weston ran the Coniston fell race (14km /8.7m) second race in the Lakes Grand prix series, a superb route up Wetherlam, Swirl How and Coniston Old Man finishing with a wicked direct descent back down to Coniston village. Alison finished in 1:47 (1st V50) and Mary Gibbons first time around the course in 2:05. 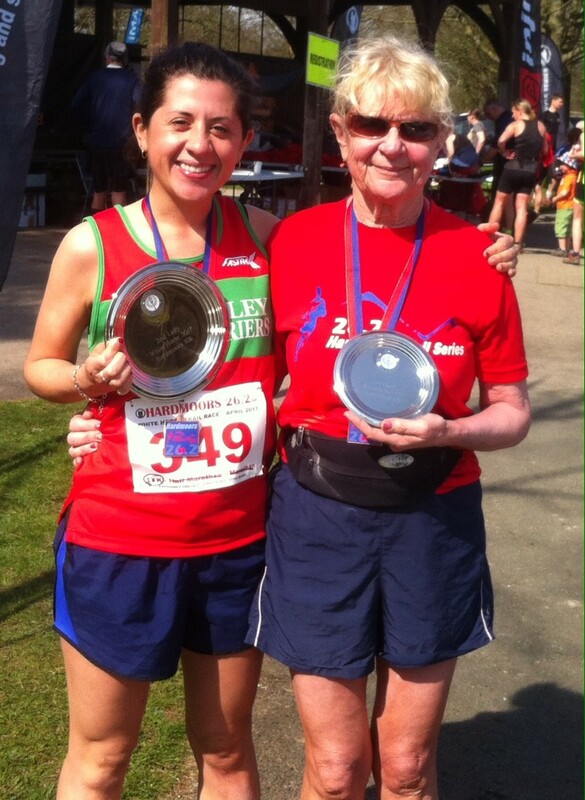 Helen Waddington set a FV40 record in the Ilkley Skyine challenge in Friday 28th April of 4:23:19. The route is 22 miles long with 850m of climbing and joins Beamsley Beacon, Round Hill and the summits along Burley Moor, Ilkley Moor and Rombalds Moor, starting and finishing at the Hermit in Burley in Wharfedale. From Tim Buckingham ... I completed the London Marathon today in 3h 28m 57s This is a PB for me and was hard earned! 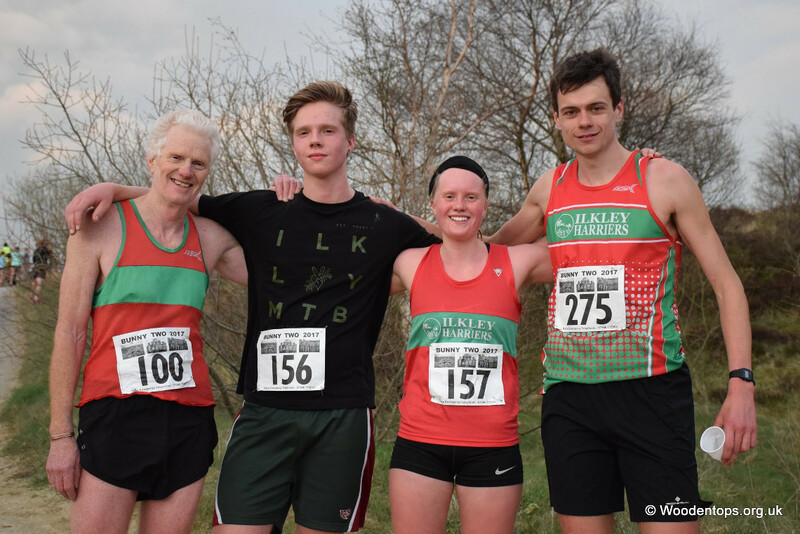 Thank you to Ilkley Harriers for the opportunity to enter the race! 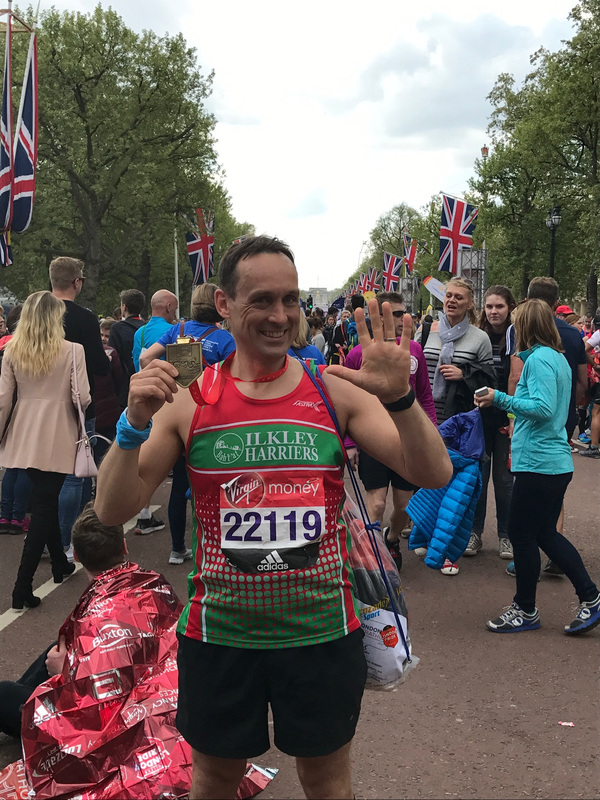 I completed the London Marathon today in 3h 28m 57s This is a PB for me and was hard earned! From Brian Melia I ventured over to Madeira for the MIUT - Madeira Island Ultra Trail. It is now part of the Ultra Trail World Series. It began in Porto Moniz on Saturday 22nd April 00.00 winding up mountain footpaths and Levadas, towards the plateau of Paul da Serra. Headlamps were required till about 7 am.The route is difficult and there are some technical ups and downs before arriving at the brilliant Pico Ruivo and a magical trail in tunnels and narrow hanging paths to Pico Arieiro 1810 M. I was completely stunned how beautiful this trail had become from the start to the highest point. From here the route is more downwards along single tracks in Funduras mountains and then along Levada of Canical and finally along a Levada to the final destination on Machico. It was no push over at 115 km and 7100D+ of height. My gps read 127 km which it felt more like. Some of the climbs were mental and I had to dig deep just to keep moving. Earlier at 4.45 I was falling asleep and tripped a few times. The drops were potentially fatal, so I found a bench to sleep on like a drunk. I woke after 30 mins ready to roll all refreshed The aid station crew were friendly and had good food to keep us filled and plenty of fluids, essential in the heat. I ran for the second half of the race with another English runner Tom Knight, who did a lot of leading along the tracks and keeping good passage, he was fab company. We ran in at 22hrs11mins. 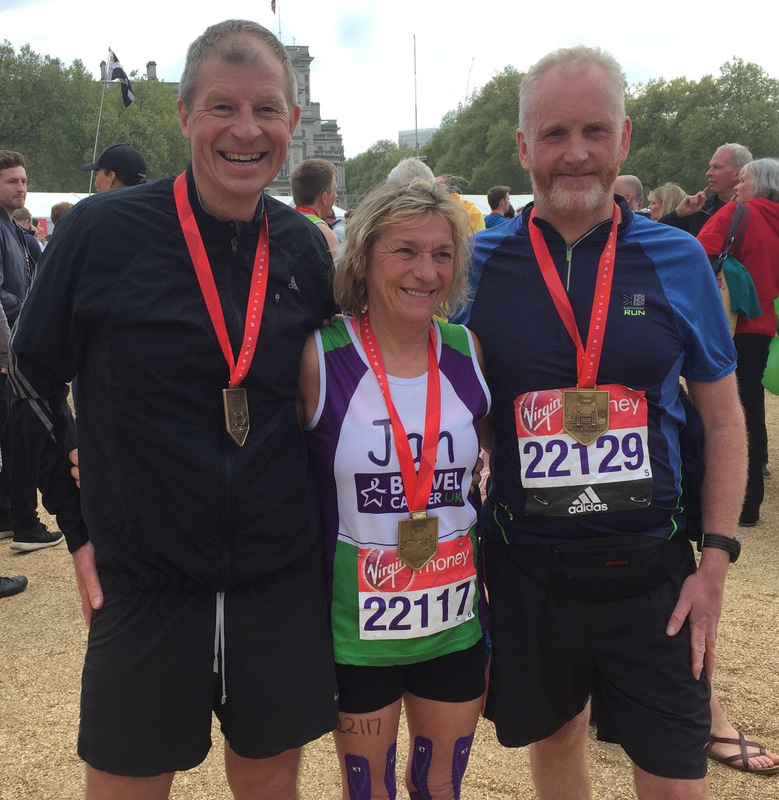 I was pleased to finish even in this slow time and 172nd position as earlier my right leg and hip had been very painful and I was not even going to begin, rather start my holiday early. Looking back it was a lovely event and very well run and as always the Ultra Trail community are great fun. Franchise D'Haene won the men's race, Beth Pascall was first Brit and 2nd lady. I claim 2nd Brit........a lot further back though. It is worth a trip as this is my first time to Madeira and it is stunning. w.
This is a formal notice of an Extraordinary General Meeting of members to be held on Tuesday evening 2nd May 2017 at 8:30pm at ILTSC (the tennis club on Stourton Road LS29 9BG), regarding the Junior section's plans to build a compact training facility at Ben Rhydding. More information on the committee page. From Petra Bijsterveld ... The 10 mile distance has become more popular in the Netherlands in recent years, though I imagine not a single Dutch participant thinks in miles, apart from me! I managed to get a last minute entry through a transfer and joined my friends for this race in what was my home town a long time ago. A two lap flat course taking in some lovely scenery along the river IJssel, we had to contend with a stiff breeze but otherwise conditions were good. It seemed a good opportunity to have another crack at breaking 90 minutes which has always eluded me. It wasn't easy but I managed to pace it evenly and was delighted to reach the finish with a good 30 seconds to spare. 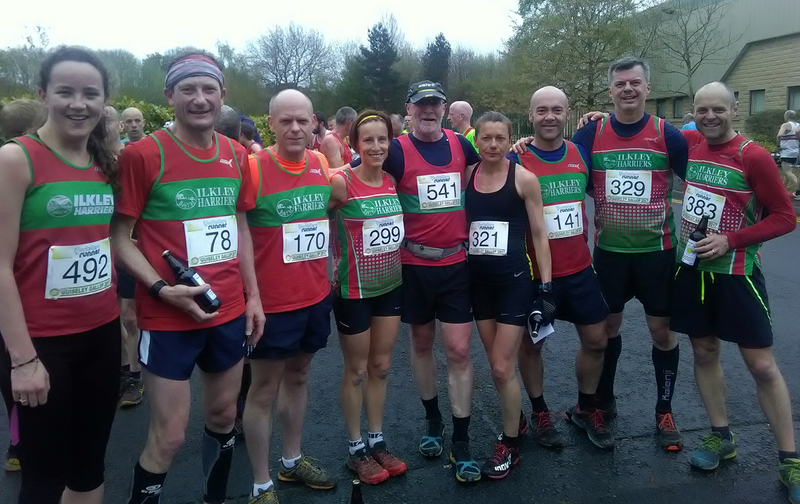 From Vince Gibbins ... Bernie and Catherine Gibbons took part in The White Horse 10k, one of the Hardmoor off-road races, on Sunday. This series comprises seven beautiful, challenging runs in various locations around the North York Moors. It's known as the only series where you can legitimately ask 'How far is a 10k?' The White Horse was in fact a 7.5 mile course and included 1,000 feet of climbing, taking in Gormire Lake, the heights of Sutton Bank and parts of the Cleveland Way. It was a spectacular course with stunning views on a beautiful, sunny day. From Alison Weston ... I was the only Harrier to do the first British fell running championship race, Donard Challenge, in the Mourne Mountains on Saturday but it was well worth the effort. Classed as a 'short' race (10km) it starts from sea level in Newcastle and climbs 900m to the top of the highest hill in Northern Ireland and then returns a more direct way back down over tussocks and rocks. We were rewarded with a magnificant view from the top of a cloud inversion over the sea (unfortunately I didn't dare take my eyes off the ground on the descent). The winner was Tom Addison from Helm Hill Runners in 58:03 and Wharfedale Harriers had some great results too. I was content with 198th (6th FV50) in 1:29:06 but keen to return to do more races in the area. 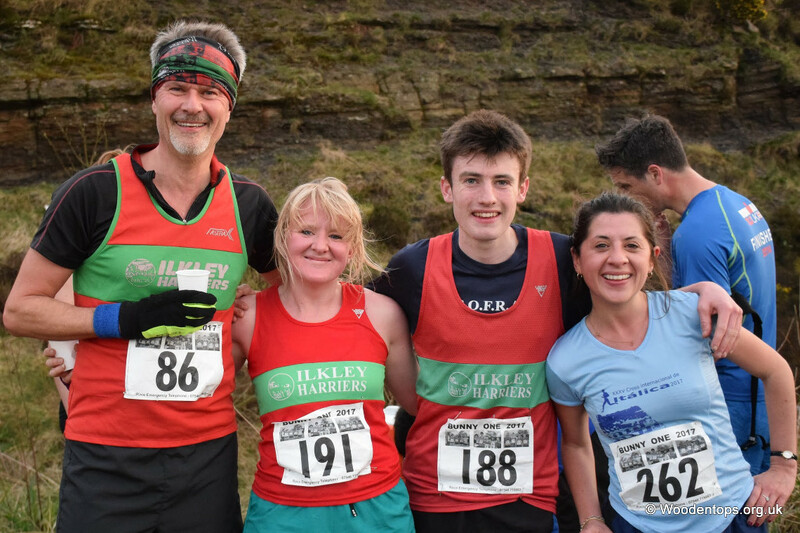 From Ewan Welsh ... Ilkley's young guns were out in full force on Pendle Short Fell race, as Ewan Welsh and Mike Baldwin were competing in their first V50 and V60 races (respectively ! ), with Norman Bush (V70) also appearing. The route covers 4.5 miles/1500ft, consisting of a bit of road at the start/finish, one steady/steepish climb, one downhill, another steep climb, another steady downhill. Finishing order amongst the three young fellas was Ewan, Norman, Mike. Apologies if any other Harriers where in attendance that we didn't spot. Results soon.